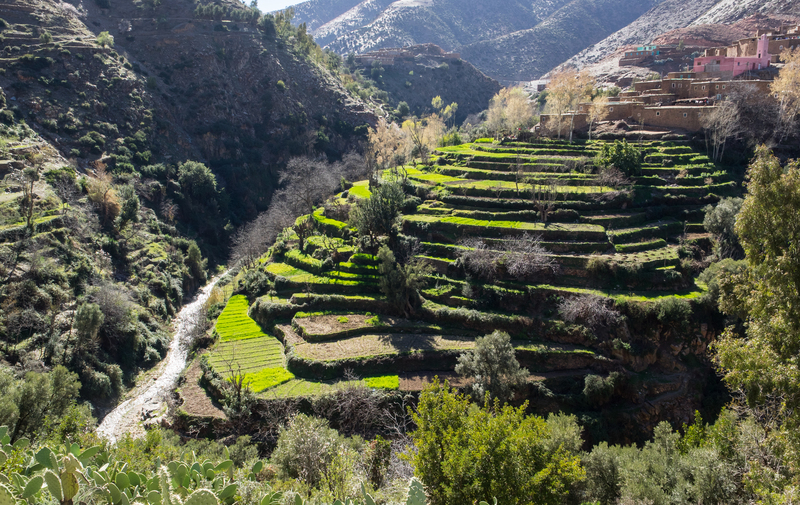 This Overview Brief introduces the topic of vertical integration, the process of linking national and sub-national adaptation planning through the National Adaptation Plan (NAP) process. A number of separate sNAPshot briefs provide further detail on approaches specific countries have taken to vertical integration in NAPs. These and a detailed guidance note for linking national and sub-national adaptation can be found in the further resources section below. As countries around the world move forward with their National Adaptation Plan (NAP) processes, increased attention is turning to the role of subnational actors—including sub-national authorities, local organizations and communities—in adaptation in general and the NAP process specifically. This role is crucial to meeting one of the two objectives of the NAP process: integrating climate change adaptation considerations into new and existing policies and plans, including across different levels from national to local. Years of experience with community-based adaptation and other locally driven approaches to climate risk management have demonstrated the potential of sub-national actors in facilitating adaptation, particularly for the most vulnerable groups and communities. The question now is how to ensure that NAP processes build on these experiences, further empowering sub-national actors with information, capacity and resources to support local adaptation into the future. This process, called vertical integration, aims to create intentional and strategic linkages between national and sub-national adaptation planning, implementation, and monitoring and evaluation (M&E). Vertical integration is an iterative process that occurs throughout the different dimensions of the NAP process. During planning, the aim of vertical integration is to ensure that adaptation planning processes at national and sub-national levels are informed and mutually supportive through dialogue among stakeholders at different levels. When it comes to implementation, vertical integration facilitates coordination and collaboration on adaptation among national and sub-national actors, with a particular focus on enabling access to information, resources and capacity for sub-national actors to implement adaptation actions. Vertical integration in M&E systems involves capturing sub-national adaptation processes, outcomes and learning, while also ensuring that national-level learning informs sub-national action. 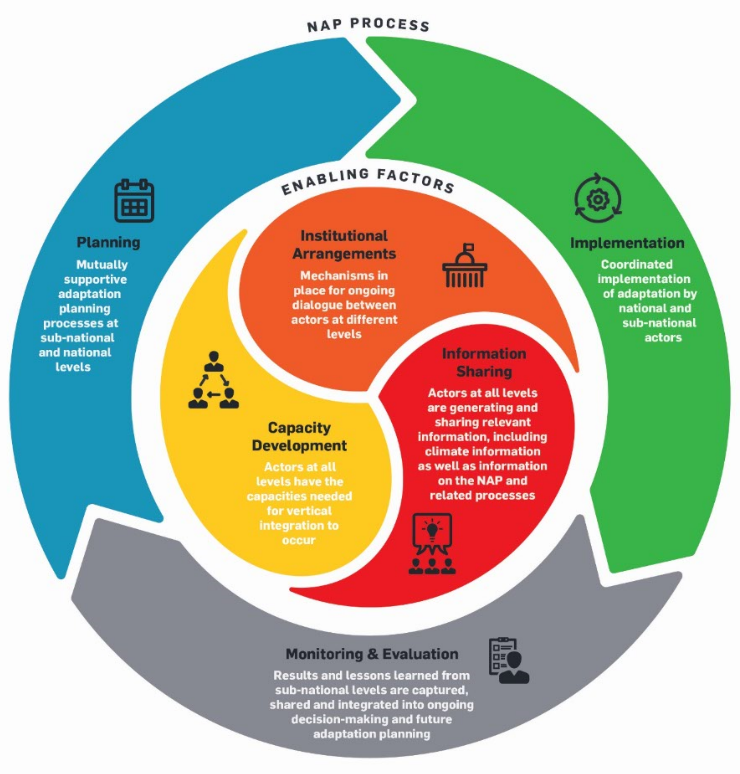 As shown in Figure 1, there are three key factors that enable vertical integration in the NAP process: institutional arrangements, information sharing and capacity development. Progress on decentralization at the country level provides an important foundation for vertical integration. Decentralization is the process through which powers, functions, responsibilities and resources are transferred from central to sub-national authorities and/or to other actors operating at sub-national levels, establishing a system of co-responsibility between national and sub-national actors (United Nations Economic and Social Council, 2006). It is based on the principle of subsidiarity, which aims “to ensure that powers are exercised as close to the citizen as possible” (European Parliament, 2016, p. 1). This means that decision-making power should be employed and resources allocated at the lowest feasible or appropriate administrative level. Given the localized nature of climate risks such as droughts and floods and the effects of increasingly uncertain weather patterns on livelihoods, particularly in rural areas, decentralization of adaptation decision-making is a sensible way forward. This will be more straightforward in countries where the process of decentralization has advanced, as mechanisms will already be in place to facilitate sub-national planning, channelling of resources for implementation and M&E. Where this is the case, these mechanisms can be leveraged for the NAP process. In other countries where there is less progress on decentralization, NAP teams will need to find alternative ways to engage sub-national actors in the process. There is no single way to approach vertical integration. Most countries have a mix of topdown and bottom-up approaches, with adaptation processes occurring concurrently at national and sub-national levels. The key is to ensure that these processes are connected and coordinated, informing each other over time. For this to occur, those coordinating the NAP process at the national level must work together with sub-national authorities, local organizations and communities throughout the planning, implementation and M&E dimensions. Potential roles and responsibilities of these three types of actors are shown in Figure 2. Again, the enabling factors are key to facilitating these relationships and empowering actors at all levels to fully participate in the NAP process. Fulfillment of these roles and responsibilities begins with a commitment by the NAP focal point/agency to an inclusive and participatory process. Such a commitment recognizes the importance of taking local diversity into account in the NAP process, the critical role played by sub-national actors in adaptation, and the need for NAP processes to generate benefits for vulnerable ecosystems, communities and groups in order to be effective. Each country will need to define their particular NAP process and approach to vertical integration, based on existing mechanisms, capacity and resources. The sNAPshot country briefs that accompany this overview (available below) illustrate a range of different approaches to linking national and subnational adaptation planning, implementation and M&E, and the roles that national governments, subnational administrations and local actors can play in these processes. Read "Vertical Integration in National Adaptation Plan Processes: A guidance note for linking national & subnational adaptation"
Read "A Framework for Gender-Responsive National Adaptation Plan (NAP) Processes"
This article describes the findings and outcomes of a joint FAO-UNDP Integrating Agriculture in National Adaptation Plans Programme that provided advanced training to improve adaptation planning.